It is here where we will show you how Australian households, governments and businesses sustain the economic growth of our nation through our demand for credit and by going further and further into debt. Our economic prosperity is primarily achieved through taking out more debt tomorrow than we have today. This continual refinancing avoids situations of payment defaults and negative economic growth. To put this into the context of dollars, Total Australian Credit was $3.5 Trillion at the beginning of 2009, only a few months after the Global Financial Crisis. Now, only eight years later our total credit reached $6.1 Trillion, an increase of $2.6 Trillion. In the previous 8 years leading up to 2009 this credit only increased by $1.8 Trillion. And, in the 8 years prior to 2001 the credit increased a little over $800 billion. Australia’s relationship with credit and debt is exponential in nature - increasing at an increasing rate. At the current rate of expansion, we will hit $10 Trillion in Total Australian Credit by 2026. 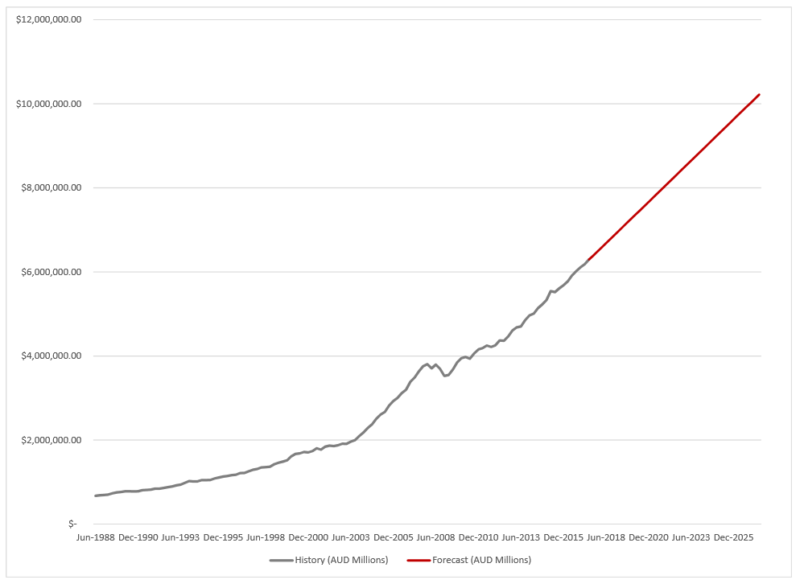 Australian Debt Clock is dedicated to informing the public of our nations trending debt levels. These debt levels are given in isolation of a vast amount of economic data and information that this website does not explore, and therefore should not be used as a sole point of reference. Australian Debt Clock seeks to create awareness around an economic issue that has many dimensions. This website only explores the aggregating levels of debt amongst the different sectors of the Australian economy, and seeks to remain unbiased of the positive and negative economic implications. Rather, this website will pursue presenting impartial information that will serve as a point of reference for users. It is the intent of this website to encourage conscious and open-minded thinking in relation to Australia’s economic situation. Financial literacy and awareness of our nations trending debt levels is an important part of reaching a well-rounded economic understanding. Please share this information with family, friends and colleagues to ensure they are educated and up-to-date with the numbers behind our current economic times.